How can I post Pookatoo text to Facebook? After creating your text on Pookatoo and downloading it, you should be able to add the text image normally to Facebook with the photo/video option when making a new post or comment. However, especially for animated text, we strongly recommend using a white background when making text for sharing on Facebook - simply change the background colour to white in the "Background" option in Pookatoo (see the next question below for more details). The text should look much better, and especially for animations, it should make it so that it won't have any rough edges around it. For animated .GIF images, Facebook used to have a special way of dealing with them where you needed to upload the "Direct Link" code from e.g. the "Get Web Code" page on Pookatoo. However, it now seems that animated images will play properly even when uploaded as a normal image in a post or comment. You can still try copying and pasting the "Direct Link" code in to a Facebook post if it's easier or if you're having problems. Sometimes Facebook may give you a warning that the minimum height for a 'video' is 120 pixels. In this case it is treating the animated .GIF image as a video, so you would need to use a larger text size on Pookatoo. We suggest using the "XL" or "XXL" size buttons on Pookatoo for single-line text, which should create text taller than 120 pixels. This is another warning message from Facebook that's related to the dimensions of the animated GIF image being too wide, in relation to the overall height.. In this case it seems that the easiest solution is to reduce the number of letters in the text, and perhaps increase the text size. We may add a setting in future to add vertical empty space to the text in order to avoid this Facebook warning. Note: Uploaded animations may take a little time longer to appear on Facebook after posting compared to normal posts. 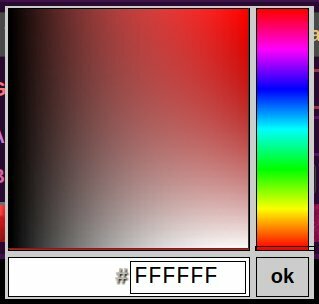 Simply open the background colour swatch in the Pookatoo control panel and drag the colour selection to the white area in the very bottom right, then press "ok" (the colour value will change to #FFFFFF). Most animated .GIF files should now play properly on Facebook, however sometimes they need to be clicked/tapped for the animation to start playing. One other point is that if the image is too wide with a small height, Facebook will open a new window to play it, instead of displaying it on the current page. Note that Facebook may continue to change how animated .GIF images are handled, and they may behave slightly differently depending on how Facebook is accessed (e.g. Facebook mobile app vs. opening Facebook in a web browser).